You’d like to think of yourself as a green friendly guy. You recycle. You use energy-efficient light bulbs. You try to remember to bring your own bags when you go grocery shopping. Hell, maybe you’re even against factory farming. Unfortunately, you’re going to have to do a lot better than this if you want to keep your “Organic Girl” happy. When you met, you probably didn’t know all this about her, but a few months into dating, you realize that everything she owns is all natural, fair trade, and renewable. While that’s great for the environment, it can be a drag on the pocketbook and time consuming. Here are the two main things you can do to make dating an Organic Girl easier and help convince her that you’re not the biggest threat to the planet. Food is a big deal for Organic Girls. There’s a good chance that she’s Vegan, or at least Vegetarian. If she is, don’t sweat it, but don’t think she’ll be a cheap date – not with the high-end restaurants that are popping up all over these days. While you have to decide for yourself whether to make any kind of dietary switch to appease your lady, we’re going to assume that she’s fine with you eating what you like. 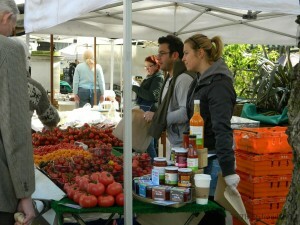 Even so, you should find out about local farmer’s markets, fairs, roadside stands, orchards, anything like that. They can be cheap dates while you bring her around and she can pick out locally grown vegetables to her heart’s content. Also try to find a menu online before you take your lady to a new restaurant. Vegans end up eating a lot of salads and chips, and while they’re generally happy with them, taking her somewhere with a more diverse menu now and then will really earn you consideration points. The second main issue for an Organic Girl is cleaning supplies. You may want to give your countertop a streak free shine, but she probably doesn’t want to inhale chemicals that have only been consumer tested for a couple of decades. Fortunately, there’s a variety of all natural cleansers that work fairly well, and tend to smell a lot better than your standard industrial cleaner. Buy a bottle or two, and you can whip them out to impress her any time there’s a sticky spill that needs to be scrubbed up. The same applies to all sorts of household cleaning products, from dish soap and furniture polish to hand soap and laundry detergent. These products are occasionally a bit more expensive, so this might be something you only want to use when she’s around, the way you stick the pate and calves liver in the back of the fridge. Tote your disposable grocery bags, use old jam jars as drinking cups, and recycle, recycle, recycle. Keep doing everything you’ve been doing this whole time, and just add these two simple fixes to make your Organic Girl think that you really get it. Hopefully, she’ll see the effort that you’re putting in without even having to be told and be more forgiving the next time you buy a Chapstick without making sure it hasn’t been tested on rabbits.